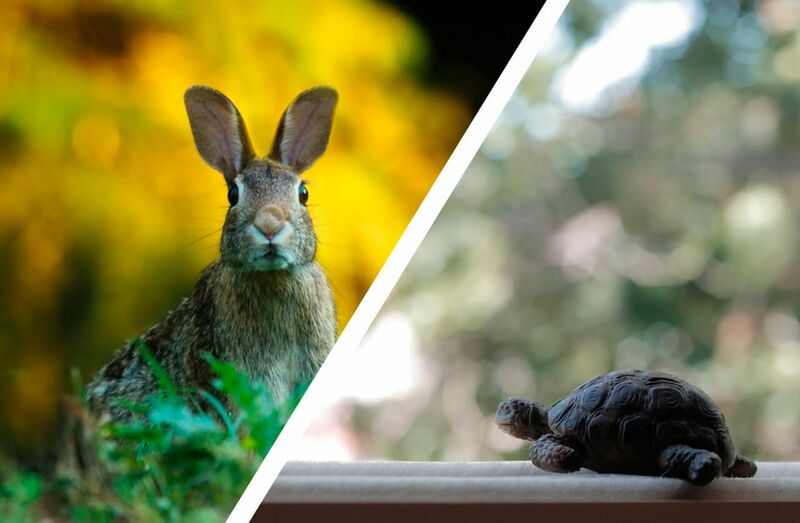 We’ve all heard the story of the race between the turtle and the hare, where the turtle’s constancy defeats the hare’s speed. And it is usually true, except when it’s not. While it is obvious why exhibitors want to take booth graphic design in their own hands, we want you to consider the available options. Good trade show booth suppliers are in business to keep you in business. They help you be as fast as the hare without losing your business shell, nor the race to the trade show. Read about the main reasons to let an expert help with your booth graphics. Graphic design effectiveness depends on the contextual application. This means creating a great brochure requires a different skill set than the one used in a trade show booth. The point here is you don’t have to be an exhibit expert, nor hire one, to get the maximum booth impact with your graphics. Good exhibit suppliers and manufacturers offer free services* that will help you achieve your goals at no extra cost, and will be as fast as you need them to be. If you already have a brand manual, you know what a delicate task it is to create pieces that adhere to the manual’s guidelines adequately and coherently. 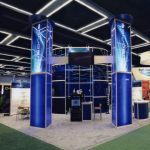 Considering the scale factor of large format graphics, there’s a great risk that your usual graphic process doesn’t quite apply for the challenge of a trade show. Take advantage of professional services* and let them optimize your booth graphics to match the brand manual and maximize display impact. If you are still working on your brand manual, no need to panic. As long as you have a clear vision of what you want to communicate, a good graphic designer can help translate that into an attractive layout that will entice visitors to your booth. There’s a complex technical process involved in the printing of your graphics. Starting with the digital pre-processing, you need to ensure that colors are vibrant, that a proper resolution for the desired scale is used, and that sharpness is maintained. A good designer offers expertise to ease the process and keep costs low for your business. There are many details to consider, from proper black formulation to adequate gradations that don’t result in unsightly banding. It does pay to let an expert take proper care of these technicalities. The graphic printing process entails compensating for such external factors as illumination and positioning of accessories in your booth. Usually, even skilled graphic designers lack the experience to properly accomplish a 3D composition that accounts for shadows, obstacles, and variable lighting. Colors and sharpness, luminance, brightness, and composition are a heavyweight to balance with one hand. Graphic designers spend years learning how to combine colors and textures to achieve winning layouts. They can provide valuable input to allow your vision to communicate the message in a more clear and convincing image. The secret to understanding the turtle’s story are the hidden costs: in the case of large-scale graphic design, learning by trial and error is an impossibly expensive process. And when you have an opportunity to let a graphic expert give you a free ride to your marketing goal, you should listen to the hare within you. Such a valuable service doesn’t have to cost you more. *Exhibitdeal.com offers free graphic design as part of your deal. Contact our trade show experts about it. Conditions and limitations in our free graphic design services apply. Contact us at sales@exhibitdeal.com or call 866-577-DEAL right now!